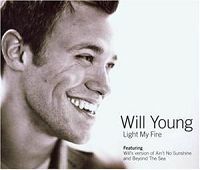 The song Will Young - Light My Fire is professional recreation. It is not by the original artist. All Time Love Will Young Your browser does not support the audio tag. Changes Will Young Your browser does not support the audio tag. Come On Will Young Your browser does not support the audio tag. Friday's Child Will Young Your browser does not support the audio tag. Hopes and Fears Will Young Your browser does not support the audio tag. Jealousy Will Young Your browser does not support the audio tag. Leave Right Now Will Young Your browser does not support the audio tag. Light My Fire Will Young Your browser does not support the audio tag. Losing Myself Will Young Your browser does not support the audio tag. Love is a Matter of Distance Will Young Your browser does not support the audio tag. Switch it On Will Young Your browser does not support the audio tag. Who Am I? Will Young Your browser does not support the audio tag. Your Game Will Young Your browser does not support the audio tag.